In the Netherlands we waste 210.000 kiloton textile each year. The equivalent of 350.000.000 pairs of jeans. There is an incredible potential in this waste stream to become the recourse of new materials in a circular economy. BiOrigami researches the application of new biocomposites in architecture i.c.w. the Amsterdam University of Applied Sciences (UvA) and NEXT architects. 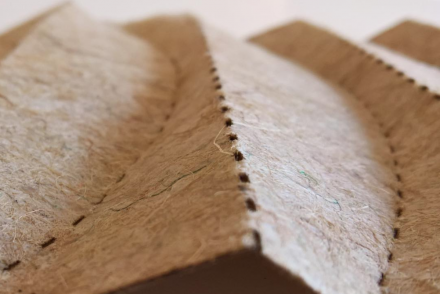 The material is composed of a bio-based plastic and textile waste from old jute bags and jeans: a circular biocomposite. Combining Japanese origami and digitalproduction techniques, BiOrigami investigates how biocomposite materials can become functional, sensory and flexible architectural products. Origami techniques add important qualities to the flat biocomposite, including structural capacity, flexibility and acoustic properties. NEXT architect’s circular Waterfront Pavilion in Amsterdam North serves as a testcase. BiOrigami is the result of a research project i.c.w. the research programme Urban Technology of the Amsterdam University of Applied Sciences (UvA) and NEXT architects. It was awarded a Kiem grant by the Netherlands Organisation for Scientific Research (NWO) with a Kiem grant.